Several years ago, I ran across the BBC television show, Victorian Farm. I watch television only very rarely, but I found this show fascinating. The show's premise is basically a “reality show” about farm life during the Victorian era, so its participants live on this farm for a full year, seeing if they can successfully farm as farmers did in that bygone era. The show that I happened to stumble across was an extra-special one. It was their Christmas episode where they made traditional gifts, food, games, and decorations. And while the show didn't go into great detail about the traditional foods of the time, it certainly got my wheels turning. The foods of the time certainly would have been either preserved items or whatever seasonal foods were available, so what foods would they have eaten and prepared for such a celebratory time of year? And for those of us who like to make use of traditional preparation methods, is there anything we can learn from cooks in that era? Well, after spending far too much time in delightful research, here are my takes on three popular Christmas recipes that feature seasonal or preserved foods commonly found during the Victorian era, as well as links to other favorite foods that deserve a place on any Christmas table, regardless of the period of history. 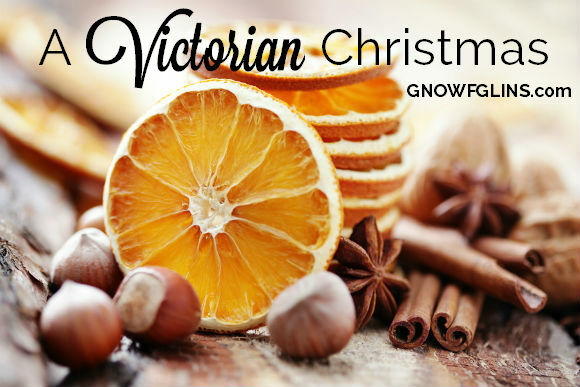 Christmas in Victorian times focused very heavily on food and family and very little on gifts. Thus, the Christmas feast was held in high regard and it seems that every family — regardless of class — made the effort to feast and celebrate together with the best they could afford. Lastly, kitchens had proper larders, so they were able to store certain fresh, local produce, such as apples and onions, for several months without preserving them. And just to make sure it doesn't get buried at the end of all these recipes, here's a short list of other seasonal and preserved foods that are great for traditional Christmas feasts. Goose, seasonal in England due to migratory patterns, was readily hunted, and while this may seem pretentious to us, it was both easily available and seasonal. Now, you may certainly make this recipe with turkey if that's what's available to you, but I'm including it here with the traditional goose merely because it would make Mrs. Beeton happy (and because I'm hoping those of you who hunt will be able to put the recipe to good use). Fill a medium saucepan 2/3 full of water and bring it to a boil. Place the onions in the boiling water for 5 to 7 minutes. Remove with a slotted spoon and, when cooled, chop finely. In a large bowl, combine the minced onions, apples, sage, rosemary, thyme, pepper, and butter. Stuff the cavity of goose and truss as desired. Roast goose for 15 minutes, then reduce heat to 350 degrees Fahrenheit. (Allow approximately 15 minutes per pound — including the weight of the stuffing — so about 2-1/2 hours for a 8-pound goose plus stuffing.) Roast until the internal temperature registers 180 degrees Fahrenheit. The legs should move freely and the juices should run clear. Meanwhile, prepare the gravy. Sauté the giblets, onion, and carrot in the butter in a large heavy-bottomed saucepan until the giblets are browned and the onions begin to caramelize. Add the stock, herbs, salt, and pepper. Simmer, partially covered, for about 1 hour, skimming as needed. Strain, skim off the fat, and serve. 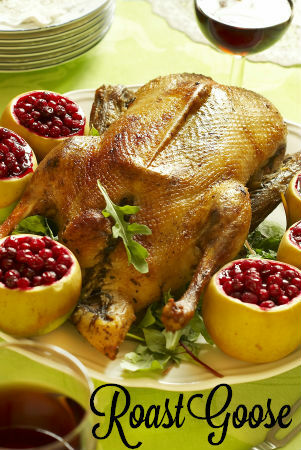 Garnish the goose with cranberries, apples, and other favorite seasonal fruits as desired. 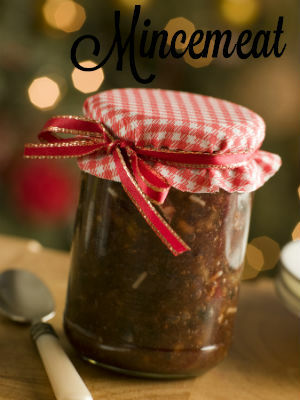 Making mincemeat was a method of preserving meat by drenching it in alcohol and sealing it in fat. The recipe dates back to the twelfth century when Crusaders returned from the Middle East, where heady spices and fruit often accompanied savory dishes. Thus the tradition of mixing meat, fruit, and sweet spices was familiar in Victorian kitchens, but it was only during the Victorian era when the mixture became clearly associated with Christmas and popularized through Charles Dickens' A Christmas Carol. These days most mincemeat is made without meat, so feel free to skip if it desired. According to some cookbooks from the time, these jars will keep for up to ten years if stored in a cool, dark place. I'm not sure if I'm confident enough to store them that long, but this recipe can certainly be made at any time in the fall to be ready for Christmas! Place all ingredients except for meat and brandy in a large Dutch oven or other ovenproof pot. Stir well, then cover and set aside for at least 12 hours. Meanwhile, bring a large pot of water to boil, then add your meat. Simmer until completely cooked through. The time will vary significantly depending on the thickness of the meat. When the meat is cooked, let cool and chop fine. Set aside. When you're ready to cook your mincemeat, preheat the oven to 225 degrees Fahrenheit and stir the meat into the fruit mixture. Cover and cook the mincemeat for about 3 hours, then remove, uncover, and let sit at room temperature to cool. Don't worry about all the fat running about — that is what's going to “seal” the mincemeat and preserve it, as well as make it super-de-duper scrumptious. As the mincemeat cools, stir every once awhile so the fat is evenly distributed. When the mincemeat is completely cool, stir in the brandy and pack the mixture into sterilized jars. Store in a cool, dark place for up to 1 to 2 weeks or follow the standard canning instructions for mincemeat for long-term storage. See canning instructions for mincemeat with meat and for all-fruit mincemeat. To make into pies or small tarts, Wardee's sourdough pie crust works beautifully. This uses a number of preserved fruits and is best if it sits for several weeks — the iconic James Beard even recommends making them one YEAR ahead! You can make it just one week ahead if absolutely necessary. This pudding was popularized by King George I, who was known for his love of pudding. 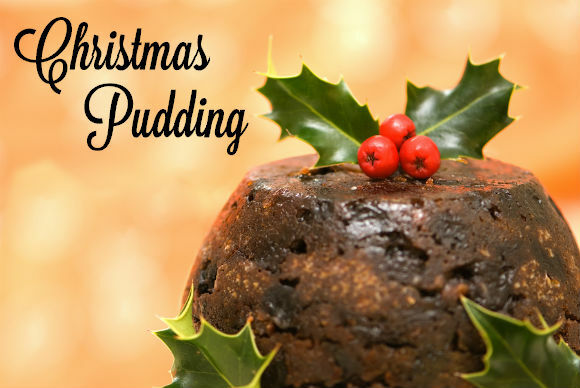 “Georgie Porgie, pudding and pie….” Both Plum Pudding and Figgy Pudding are variations of it. If at all possible, use the weight measures, as they'll give the most consistent outcome. The volumes are merely estimates and can vary according to how full you fill your measuring cup, the humidity in your climate, the brand of your flour or fruit, and a myriad of other reasons. Lastly, I should add the disclaimer that I have not yet made the Christmas Pudding listed here. As it takes weeks to age, I wasn't able to finish one before writing this post, although a number of these puddings will be curing on my shelves soon. I'll be sure to give updates if needed, as I'm certain that making these each Christmas will be a new tradition in our family. The day before preparing the puddings, first prepare the suet by placing it in a food processor along with 1 tablespoon of flour and pulsing until it's very fine. Then place the fruit, peel, and suet in a medium bowl. Pour 1 cup of the brandy over it, making sure all the fruit is completely covered, as the fruit will swell. Cover and set aside. The following day, prepare the breadcrumbs, if necessary, by tearing fresh pieces of bread into chunks and pulsing them in a food processor until fine. You should have 5 cups of breadcrumbs when you're finished. Dump into a very large bowl, then pour the milk and the remaining cup of brandy over. Toss and let sit at least 15 minutes. Meanwhile, prepare your molds and steamer(s). This recipe makes (very approximately) 28 cups of pudding batter, so prepare enough molds to hold that volume. Size doesn't matter much, so I recommend anything from Pyrex mixing bowls or wide-mouth Mason jars to actual ruffled metal pudding molds. The only considerations to remember are that the mold must be able to sit in boiling water for several hours, you'll want to store the pudding in this mold (so don't choose any bowl you use regularly), and you'll need to be able to remove the pudding easily when it's time to eat it. Butter the molds generously and set aside. To prepare a steamer, invert a plate or set a wire canning rack inside a large stock pot (make sure the pot has a lid). Fill the pot with enough water that the water will come a little more than halfway up the sides of your molds, then set the pot to boil. Prepare multiple steamer pots if desired. Then, finish preparing the pudding. In a large bowl, beat the eggs, then beat in the sugar until thick and well-mixed. Add the flour, spices, and salt to the breadcrumbs, stir briefly, then add the egg mixture, the fruit mixture, the zests, and the citrus juices. Stir until well combined, then place in prepared molds, filling each about 2/3 full. Cover each mold tightly with greased parchment paper, foil, and string, or if using Mason jars, a metal lid. There's an excellent short video tutorial on how to fasten a cover on a mold at BBC Good Food. I would suggest that rather than removing the cover after steaming and replacing with a new cover, as in the video instructions, leave the cover in place in order to keep germs and bacteria out, since these puddings may be stored for some months. Place the mold in the boiling water, ensuring that the water doesn't touch the cover or come up underneath it. Place the lid on the pot and steam for 6 to 7 hours, replacing with more boiling water as needed to keep the water level consistent. If you've got multiple puddings to steam, just set them aside in a cool place (doesn't have to be the refrigerator) until there's room in the steamer. If you've got glass molds, be sure to let them sit at room temperature before placing them in the boiling water. After 6 to 7 hours, remove the pudding from the water and let cool completely at room temperature. Move to a cool, dark place (such as a refrigerator, a wine cellar, or the freezer) and store for up to 1 year. To serve, prepare a steamer as directed above and steam for 2 to 3 hours. (If stored in the freezer, thaw for at least 24 hours before steaming.) Unmold hot pudding onto a flame-proof plate, then at the table, pour 1/2 cup brandy over the pudding and light with a match. When the flames subside, divide into individual portions and drizzle with an orange or brandy sauce. In a small saucepan, melt butter over medium heat. Whisk in remaining ingredients. Simmer until sugar has dissolved and the sauce has thickened slightly, about 5 minutes, whisking often. Drizzle over warmed puddings. I suspect many of you are wondering this, so let's just jump in. Yes, there are suet substitutes, but know that the final textures will change and that it is absolutely worth sourcing out suet, for both the nutritional aspect of healthy fats and for the flavor. Let me explain…. 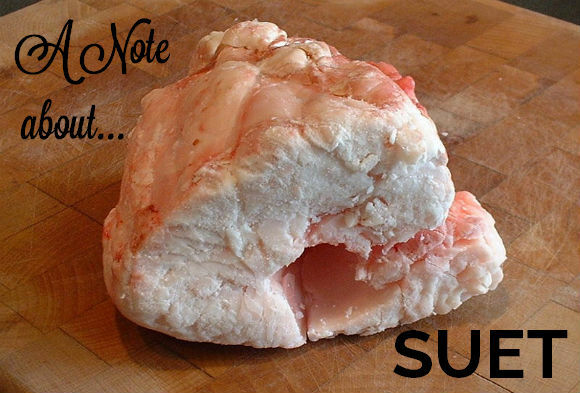 Suet is the fat around the kidneys on cows, sheep, deer, etc. On pork, this fat is called “leaf lard” because it produces superior pastries and doesn't need to be rendered before use. It melts at a very high heat point, so in the case of the Christmas pudding, for example, it is solid when it's packed into the mold and as the pudding cooks, it melts and thus leaves air pockets throughout the pudding. This is necessary (and very desirable) because the pudding is very rich and dense and those air pockets keep the texture and flavor “light” on our tongues. If you use melted butter, for example, often the resulting pudding is heavy, oily, and — while delicious — it just doesn't have the same effect. For the pudding, use either 1 pound of butter or 1 pound of palm oil plus 1 teaspoon of baking powder. Freeze the butter or oil, then grate it on the coarse side of a box grater, toss the shreds with a few tablespoons of wheat or rice flour to coat each piece, then return it to the freezer until ready to add to the recipe. The shreds should be absolutely solid when added. For an all-fruit mincemeat, you may either skip the suet altogether and just add 2 to 4 extra apples for the pectin, or use 1/2 pound butter, or 1/2 pound palm oil. Neither of these will approximate the flavor of the suet-based mincemeat, but they will certainly render a scrumptious mincemeat nonetheless. Merry Christmas to all, and may your holiday be full of feasts and family! What seasonal and preserved foods do you bring out for special occasions? Feel free to share links! Kresha is the primary writer and blog editor at NourishingJoy.com, a website dedicated to real food, sustainable living, natural homemaking, and joyful parenting. She is the mother of three young children, the wife of one handsome organic farmer, an opera singer, a cloth diapering instructor, and an avid researcher. She and her husband share a passion for living life thoughtfully and intentionally in response to God's grace in their lives and she loves to share good meals (and good wine!) around a very large table. Thanks for this post! I am fascinated with the Victorian era (I’m a volunteer docent at a local Victorian museum). BBC also had a series called “Victorian Kitchen”. I enjoyed a few episodes of it on Youtube, but it looks like it got removed. As I remember back the candied citrus peel was a rave at many craft magazine a few years back. Its easy to make and doesn’t cost much. 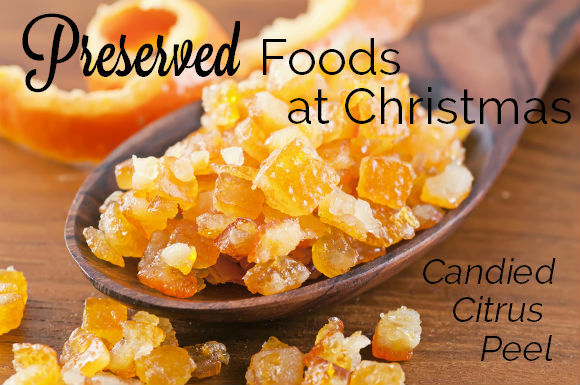 Its actually much healthier to DIY the candied citrus peel at home because it without those preservatives chemical in most commercial bought candied citrus peel sold at the store. You are so right – it’s so good! These are great! I have always wanted to make a Christmas Pudding like this, but haven’t worked up the nerve. Lol. …By the way, for some reason, this site has become very hard to see- the top part of the webpage covers a third of the screen. Is there a way to minimize the section that has the “Home Recipes Login” links on it? It’s covering up part of the title of the article even. :/ Thanks! Can the mincemeat preserve without pressure canning for 90 minutes? They can’t have done that in victorian times….hmmmm. I can’t find any other information on this. Have you experimented or found evidence that it was done this way? Is there any way to make these without the alcohol? Maybe a substitution?